Winter of Hokkaido is synonymous with snow, skiing and onsen. 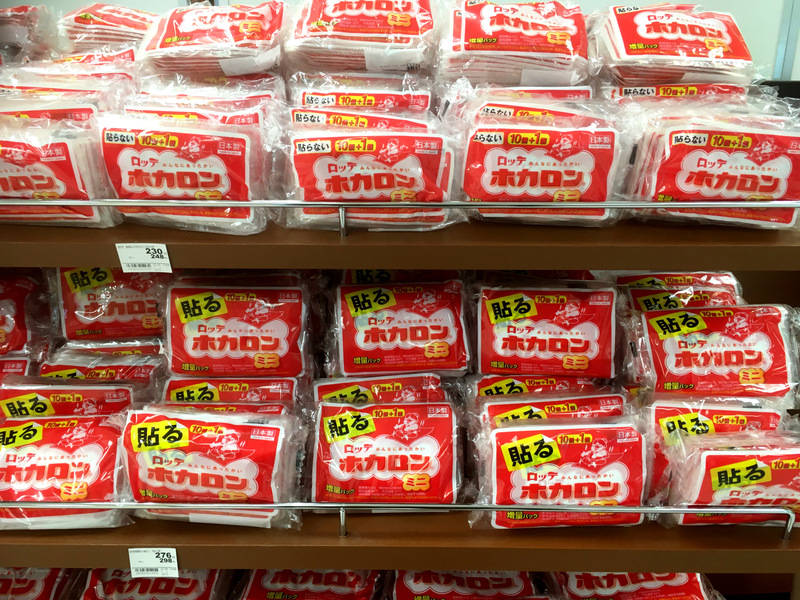 But do you know what’s the next favourite winter tradition of Hokkaido locals? Surprise, its Ice fishing. Every winter thousands of locals head to frozen lakes around Hokkaido and spend their days dipping lure through a hole. If you are travelling solo, or with a family, ice fishing is a way to experience something unique to Hokkaido. 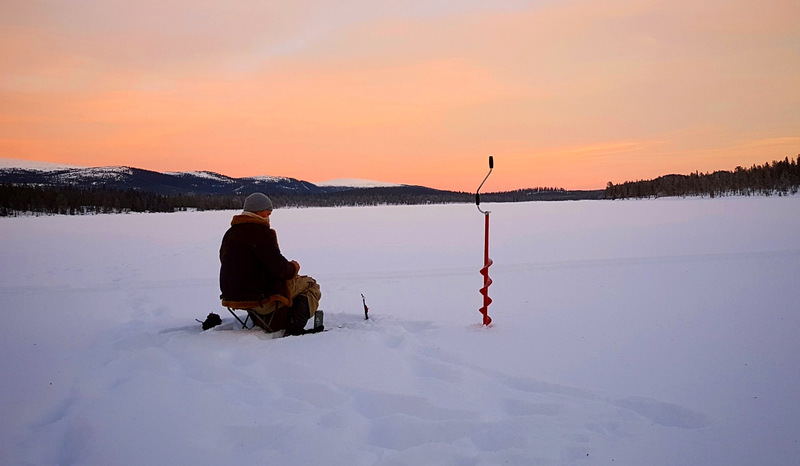 On an ice fishing trip, you can walk on water (frozen solid of course, unless you are the second coming of Jesus), pitch a tent on a frozen lake, drill a hole in ice, drop your lure, and wait for a teeny tiny smelt or a big one to catch your bait. Soon there will be a tug on your line and you will have your first catch. You don’t need to be an expert angler to try ice fishing. This activity is enjoyed by all age groups and is a great experience for kids. Read along to know where and how can you get your ice fishing experience. Smelt (Wagasaki in Japanese) is a common fish caught in Hokkaido’s lakes from late December to March. The ice fishing sites mentioned below, will lend you everything you need for fishing such as equipment, tents, heaters and bait for a small fee. The lake facilities will either dig the fishing hole for you or, they will provide you with the right tool to do so. They will also guide you with fishing tips and cook the catch into crispy fried tempura. A number of ice fishing tours are available, but if you like to explore and experience at your own pace, then this guide will come handy. 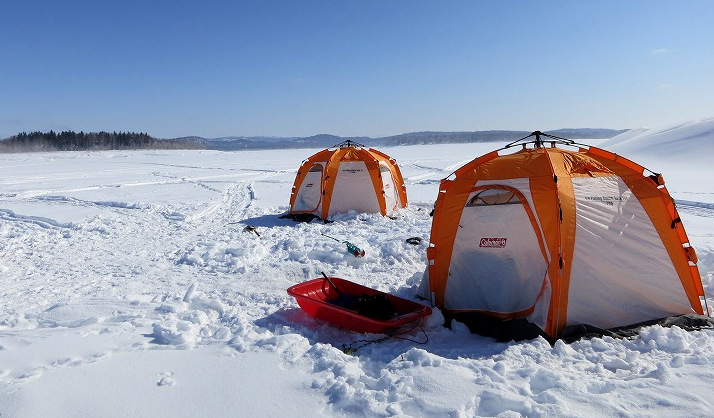 Where can you go Icefishing in Hokkaido? Lake Shinotsu is next to Tappunoyu Onsen in Shinshinotsu village. This lake is less than an hour drive from Sapporo and is also easily accessible by public transport. There are three fishing zones, where you can either sit inside a tent, or a fishing hut or just out in the open. Along with day fishing, Lake Shinotsu is also open for Night fishing. Smelt fishing season is from late December to early March. 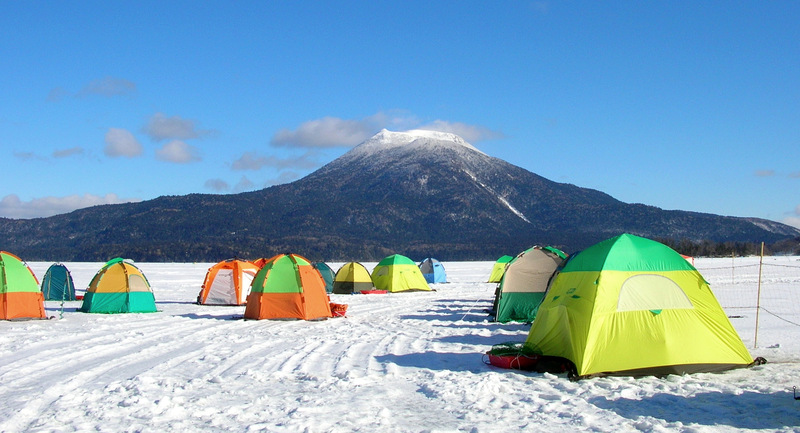 See the video below to get a feel of Icefishing at Lake Shinotsu. Lake Poroto in the Shiraoi town is a part of the Shikotsuko National Park. Shiraoi town is known for its Ainu culture, and the biggest Ainu museum in Japan (Currently closed from March 2018, reopening in 2020). From here you can make a side-trip to Hell Valley in Norboribetsu, a popular onsen town known for its volcanic activity. Lake Poroto also has an onsen nearby to heat you up after a cold day of fishing. Ice fishing season here is from Mid of January to Mid of February. Public transport: Catch JR Super Hokuto Suzuran towards Muroran and get off at Shiraoi. It is best to catch a taxi from here to the lake. Lake Akan is a freshwater lake created due to a volcanic eruption hundreds of years ago. This lake is home to a variety of fishes such as Trout, Carp, Crayfish and Smelt. Lake Akan is also known for approximately 600 million Marimo moss balls which quietly float on its surface. Apart from Ice fishing, you can also enjoy snow mobile, banana boat and ice skating here. If you are really out of luck and don’t catch any fish, you can still eat crunchy tempura at the lake restaurant. Ice fishing season at Lake Akan is from January to March. Near the lake, there’s an Ainu village, which will give you a glimpse of the ancient Hokkaido. Lake Shumarinai is a manmade lake in the Uryu district of Hokkaido. This lake has thirteen big and small islands on it. Shumarinai is the home for the largest and endangered freshwater fish in Japan called Ito (Sakhalin Taimen). Here, you can catch smelt in winter and rainbow trout from May to November. It gets really, really cold here, with temperature dropping to -40 degrees. In summer, people kayak and canoe on its waters. When you go Icefishing here, you can ride a snowmobile to the fishing site. You can also camp and stay at the log cabin accommodations. It is best to drive to the lake from Sapporo, or Asahikawa. Smelt fishing season is from January to April. Fees: Adult ticket 1100 , fishing rentals : 600 yen and tents with heater can be rented at 2000 yen. Lake Abashiri is in the Abashiri National Park of Hokkaido. The town of Abashiri is also known for its winter drift ice cruises and Prison museum. This lake is connected to the Sea of Okhotsk, which make its water brakish in nature. Here you can catch Carp, Salmon and Wagasaki along with some of the other variety of fishes. Lake Abashiri is well maintained, and there are camp grounds and hotsprings on the lakeside. From the 17th of February 2019, you can ride on fat bike on the lake. You can also participate in the annual Wagasaki fishing championship. Lake Katsurazawa is located in the Mikasa GeoPark town of Hokkaido. Mikasa is from the Jurrasic period and various types of prehistoric fossils can be seen in the locality. 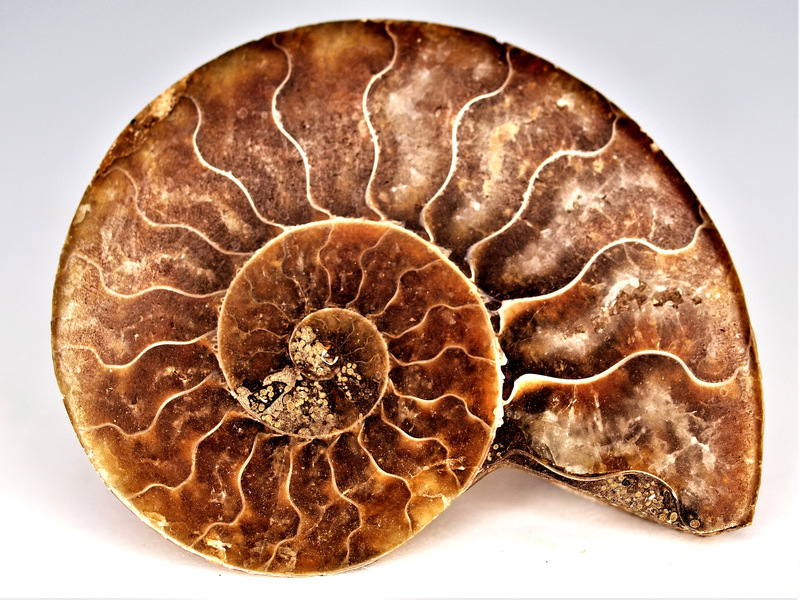 Ammonites and Inoceramus fossils from two hundred million years ago are still found in this town. When you are here, there is a strong chance to find a part of the time when dinosaurs roamed on our planet. It is best to drive to Mikasa from Sapporo. Located in the vicinity of Sahoro ski resort, Lake Sahoro is a perfect place to try various winter activities. This lake is inhabited by a number of wild birds and animals. When fishing here, you might run into Hokkaido squirrels, rabbits, racoons and foxes. This lake is relatively crowded during the ice fishing season. Fees: Adult 4320 yen includes tool rental, fishing fees, guide fee and Wagasaki frying service. How to dress for an Ice fishing trip? When you are out in below zero conditions, you need to keep yourself as warm as you can. It is best to dress in layers, with couple of warm jackets on top. Wear waterproof gloves on the outside with a thin woollen one on the inside. If you have your ski wear with you, then they are perfect too. To avoid your toes from getting frostbitten, wear thick or multiple thin layers of socks with well insulated boots. You can also use heat packs (Kairo, bought at convenience stores) inside. What to take on your Ice fishing trip? 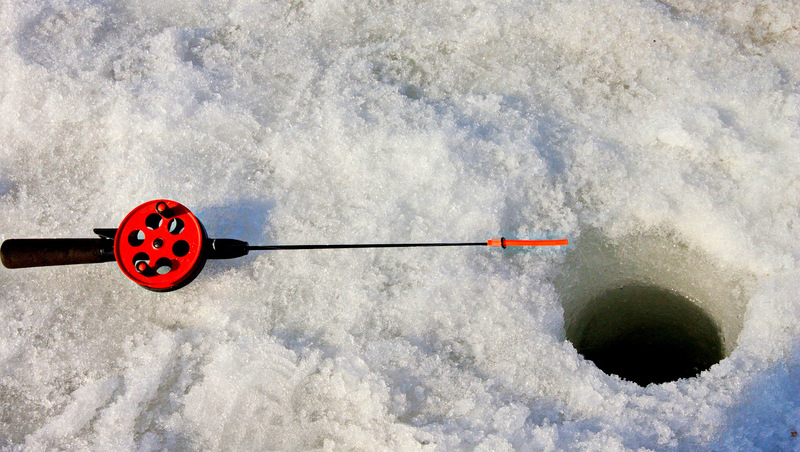 You can go empty handed to all the above ice fishing sites. However, it is best to carry some of the simpler items which will be useful on your trip. Carry a scissor to cut the baits, plastic bags to bring your catch home with you or to clean up the garbage. Face towels, along with food and drinks and a good company. I hope this Ice fishing guide will help you to plan your first Ice fishing trip in Hokkaido. For any questions or comments, write below. I will be happy to help.